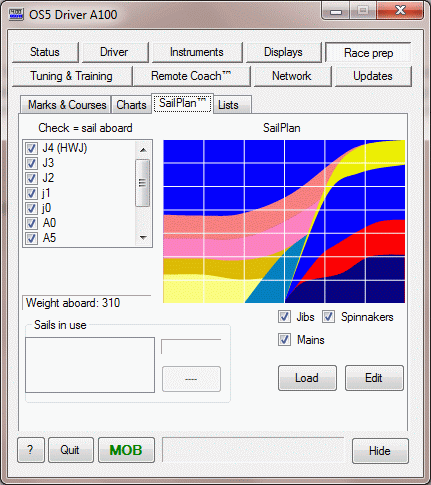 SailPlan crossover chart is a live sail display that, in conjunction with instrument data and the current course, displays sail crossover information for the current and next leg. When a polar is included, apparent wind speed and angle, and target angles are also shown. Current wind conditions (the red lines) are enhanced with ‘wind ovals’ showing the variation to be expected. With this page, you can call the sail and rig setup for the next leg, and determine if the current sail needs to be changed out. When the required information is available (true wind speed and racecourse data), the current wind conditions for this leg (the true wind angle of the rhumbline from the boat to the next mark), and next leg (true wind angle of the rhumbline of the next leg are displayed. Two things change these lines: where you are on the current leg (NOT your current true wind angle), and the value of Wind Direction. Current true wind speed is show n as a horizontal red line. If conditions don’t change, the indicated wind speed would also be experienced on the next leg. When a polar is available, apparent wind speed and up- and downwind targets can be displayed. Turn these features on and off in the SailPlan™ crossover chart setup menu. When wind and racecourse information are available, you can display a scatter plot of the last hour’s wind readings for both legs. Racecourse information is required because the true wind angle dimension is course-related. An oval is drawn around the dots denoting the RMS value of the scatter, and a trend line is drawn from the mean position. Although it might be viewed as a predictor, the trend line is actually an indicator of persistent shift and strength of the wind in the previous hour. The location of the current true wind relative to the oval indicates your current conditions relative to the wind average over the last hour. SailPlan™ crossover chart maintains an accumulated use time for each sail. Sails in use are drawn hatched. When a sail is denoted as ‘in use’, its timer is updated, providing hours used information. Put a sail in use by clicking on its shape and selecting Put in use. 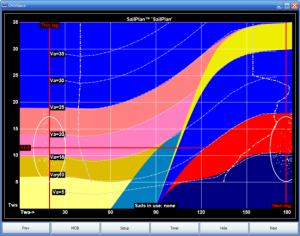 SailPlan™ editing is performed by the SpEdit application which is located in the OckamSoft 5 directory. The easiest way to execute it is to press the Edit button in the driver.